The resurgence and popularity of Pokémon over the last two weeks has been nothing short of astonishing. Who would have thought that this simple franchise from the 1990s would see such stardom as an iOS and Android app two decades later. The Pokémon Go app is a big winner. An earlier report from SimilarWeb had pegged Pokémon Go as having surpassed dating app Tinder, in terms of installs, and Twitter in terms of daily active users on Monday. It has also had an astonishing effect on Nintendo’s profits. Nintendo’s share price has almost doubled since the game was released in just a handful of countries. Officially, the app is only currently offered in 6 countries however keen beans are finding ways of getting their Poke-paws on it sooner than release dates. As of July 11, nearly 11 percent of all Android devices in the US had the app installed. And while I have been a little let down by the graphics and gameplay (which is somewhat understandable for a beta version), I do overall really like the way a strategy can be developed with regards to location and teamwork with fellow gamers. For those in the know, by this I mean using each other's lures and working together as teams in the gym. From a marketing perspective, the popularity of the app does raise some important talking points. These include elements such as the future of mobile gaming, the evolution of AR, as well as the strategic adoption and benefits of location-based marketing. So with that said, let’s explore some of these concepts a little further. While there have been a number of augmented reality experiments and projects over the last few years, the introduction of Pokémon Go has brought the technology back into the spotlight. AR is broadly defined as the "integration of digital information with the user's environment in real time." Unlike virtual reality, which creates a totally artificial environment, augmented reality uses the existing environment and overlays new information on top of it. AR is special because it is making the application engaging for users, blurring the line between gameplay and reality. But the technology is not new. Early AR has taken many forms. It was a little underdeveloped when it was used as HUD on the Pontiac Grand Prix and Aztek. It found its way into the military, being used for over a decade - most recently built into the helmets of F-35 pilots. It has actually also become quite popular in app's like - Acrossair’s New York Nearest Subway iPhone app ($1.99; www.acrossair.com; iTunes) which overlays the nearest subway stations on a picture of your surroundings by leveraging your handset’s camera. With the attention it has received over the past few weeks, there is no doubt there is a lot more to come from AR over the next year or two. Imagine this type of technology mixed into the marketing landscape, allowing users to interact with your application, designed to engage customers at home, on the go, at the shopping centre, on the streets - and doing it with games, treasure hunts, discounts, coupons, prizes, etc. AR has the ability to turn even the simplest of tasks into a fun and engaging buying experience, and personally, I believe that is the greatest drawcard for marketers. The ability to connect with consumers, taking them on a journey and transporting them into a whole new experience. But while AR will certainly provide great benefits for those in the marketing industry, other industries will begin to benefit from the introduction of AR. Think about those in the education industry and how this could help in teaching students. What about the healthcare industry looking to educate surgeons on procedures, travel companies taking virtual tours, skilled trades looking to further their training. The future of AR is certainly very, very exciting… we look forward to watching this space further. There’s a lot more to Pokémon Go than meets the eye. There are actually a number of functions to the game that you may not have heard of including various creatures that are found at specific locations called PokéStops. Users are also given the opportunity, much like in the original video series, to battle others’ collections of creatures at locations known as Pokémon Gyms. The location of the PokeStops and Gyms are currently random, designated as GPS coordinates by Niantic, the game maker. What is interesting is that PokeStops have become quite lucrative for some. Companies are beginning to exploit the app, which allows users to purchase items called ‘Lure Modules’ to ‘lure’ Pokémon to a specific location. 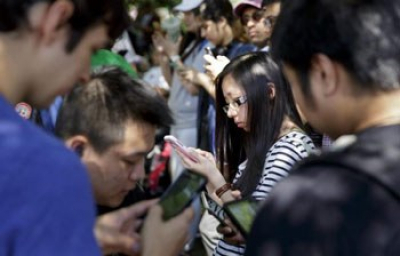 Priced at $1 each the lure modules last for 30 minutes attracting players looking for the creatures to their location. Bloomberg News recently highlighted the case of L’inizio’s Pizza Bar, Queens, NY where owner Tom Lattanzio reported an increase of weekly sales by 75 percent after buying a $10 in-game power-up that lured Pokémon (and players) to his restaurant's location. Advertising Age has talks about the cases of Huge Café in Atlanta, which is owned by Huge ad agency and used as a testing facility for new tech, has similarly placed lures to attract potential customers. It is also adding value to visitors, with such offers as phone charging stations (since Pokémon Go quickly depletes battery power) and a card for a free steamed bun if a visitor shows a captured Pokémon, in the hopes, this will whet the customer’s appetite for a larger treat. Restaurant selection is also being heavily altered by some patrons looking to capture elusive Pokémon. 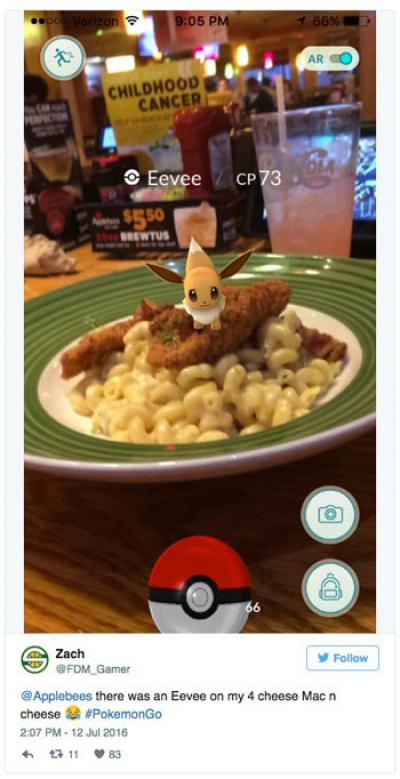 Restaurants such as Applebee’s, Domino’s Pizza and Gesa Credit Union in America, amongst others, are dropping lure modules, re-tweeting reports of Pokémon captures on their premises, as well as posting the images on their social media accounts to attrach new business. Speaking exclusively with the Financial Times, Niantic CEO John Hanke said that “sponsored locations” would provide a new revenue stream, in addition to in-app purchases of power-ups and virtual items. Simply put, brands will be given the opportunity to pay for their names to be included in the game around valued destinations, in the hope to drive customers into their stores. It was also reported by the Financial Times that the network of virtual “portals” mapped to on-street locations in Pokémon Go will be similar to the one featured on Ingress, Niantic’s previous game. Whether you’re a fan or not, the months surrounding the growth of Pokémon Go are going to be very exciting. With the evolution of AR technology, imbued with the power of location-based marketing, a new era of mobile gameplay and marketing innovation is certainly on the cards.